Will you do my eulogy? 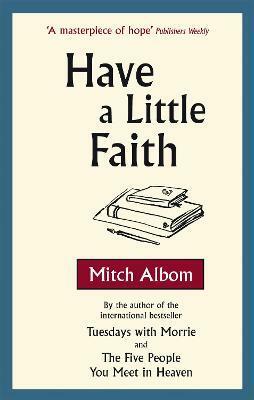 With those words, Mitch Albom begins his long-awaited return to non-fiction. His journey to honour the last request of a beloved clergyman ultimately leads him to rekindle his own long-ignored faith. Albom spends years exploring churches and synagogues, the suburbs and the city, the "us" versus "them" of religion. Slowly, he gravitates to an inner-city pastor of a crumbling church that houses the homeless, and is stunned at how similar belief can be. As his own beloved cleric slowly lets go, Albom writes his final farewell, having learned that a faithful heart comes in many forms and places.